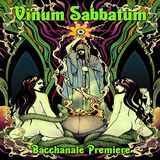 The moniker and the cover art of Bacchanale Premiere by the Finnish newcomers Vinum Sabbatum should serve as a total giveaway to the style of music they play. The band does not have Sabbatum in their name just for kicks, meaning they indeed play 70s doom, and all the floweriness on their cover hints for good helpings of psychedelia. Listening to two longer bookend songs, and especially the opener Earthrise, totally brings to mind the seminal Black Sabbath eponymous first album with its stripped down naked doom sound, not to mention Janne Salo’s voice reminding so painfully of Ozzy's weeping wails. Vinum Sabbatum, the closer song, takes us on a winding hallucinogenic journey, and the slightly sped up middle does not dilute the impact of preceding mellow section. With all their deference to Black Sabbath and Pentagram Vinum Sabbatum are far from being a cover band. They play involved complex music, as well as weave in Moog or Hammond organ in Bacchanale Premiere to add Deep Purple and Uriah Heep flavor to their proto-doom. So, go ahead and add late 60s to the 70s as well. Just listen to the stoner rock of Tombstone Rider, snappy riffs and jazzy bass noodlings of The Devil’s Cradle. Culdremne has further progressive hints and a cool acoustic interlude before descending into gloomy march. For all of their old glory and feel-good nostalgia, Vinum Sabbatum have done no favors for themselves with their sound and production. This is either by design, to sound as if the Bacchanale Premiere is coming straight from the 70s before any modern recording equipment was invented, or by accident, if they did not pay their producer enough. The whole thing sounds as if it was recorded in a live bar, which is not necessarily a bad thing, but the band is playing somewhere in the back of the dive, while you are standing all the way out front accompanied only by Janne Salo. The sound is squashed and flat, it could fit in 1 X 1" box. The drums are purely pitter-patter, background chorus vocals are barely heard. One can only imagine how nice melody in Gospel of Mary would sound or if In and Out of Faith had more heat in its guitars. Hell, it takes a couple of tracks to discern Vinum Sabbatum has keyboards, and it is one of the main elements in the band. Why even get a quality organist (Tomi Korpela) if he is buried in the sound with little definition? Listening to Bacchanale Premiere on repeat, you get to appreciate the elegant touch of psychedelia and the album’s smoothness and flow, but the feeling of "what if" doesn't let go, thinking that a truly wonderful opportunity has been squandered.